Are you looking for highly engaging nonfiction passages to help students practice close reading strategies? 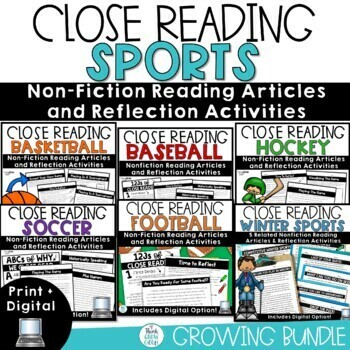 Help your students learn about baseball, basketball, and football with these engaging and critical thinking nonfiction articles, perfect to practice close reading strategies. Included are 9, two-page articles to help your students understand the history of each sport, how to play the game, and learn about famous sports players, too! These passages and comprehension questions will have your students practicing how to gather important information and reflect as they read. Activities work well as independent practice, small group work, or as an assessment. NOTE: This is a GROWING BUNDLE. All products have not yet been added. The price will increase as more products are added and the value increases. Right now save 30%. Please see the preview of each pack to see all this bundle has to offer! Recent Feedback on Products found in this Bundle"
"These were such a hit when I was tutoring around the time of our school's basketball tournament! Thanks for an engaging resource!" "I myself learned some cool info from this pack! Awesome!" "Great resource! The passages are about a topic that the kids love and the activities appear to be engaging!" "So thorough! so much that I can use across many part of our day/ties into a variety of skills we're currently working on!" "Yay! A great way to keep boys and tomboys engaged and interested in reading!" "This was SO good! Love it!!!" Did you know you can earn TPT $ as store credit just by leaving feedback?